The Penn Girls Volleyball participated in the Cathedral Tournament and finished with a 2-2 record. 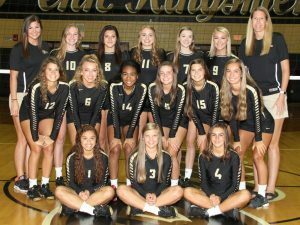 The Kingsmen beat Columbus East and New Albany, and lost to Center Grove and Cathedral. Alyssa Torres served five aces and had 21 kills in the tournament. Naomi Willis played a strong role by setting up 59 assists and 20 digs. Italia Fields was a dominant force with 30 kills. Penn worked for 141 digs in the tournament. Rachel Hickey led the team with 37 digs, followed by Sophia Cruz with 25, and Kylee Hixenbaugh with 24.